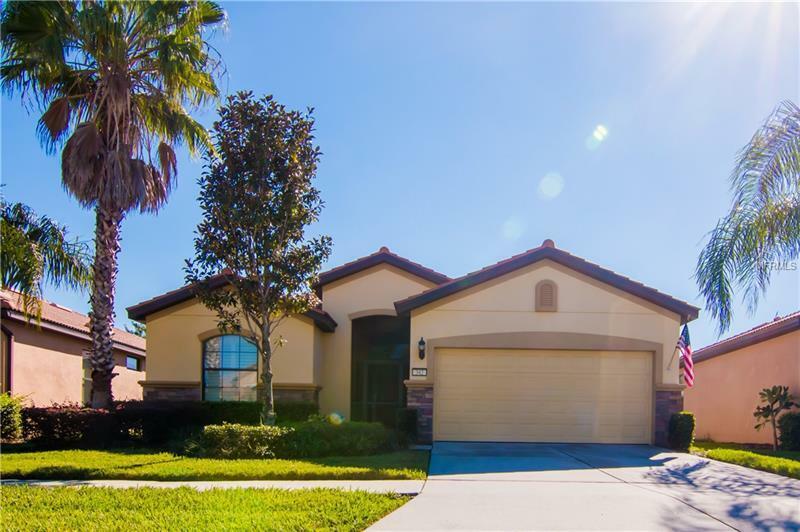 GORGEOUS POOL HOME in the community of Southshore Falls - this is 55+ LUXURY Living at its Best! UPGRADED with Tons of Amazing Features - *Sparkling Heated Saltwater Pool* *Heated Spa* *Water & Conservation Views* *Outdoor Built-in Grill Area* *Granite Countertops* *2 Car Garage* Welcome to 342 Cedar Falls Drive! Bright and Open Living Room with Slider to Pool, Kitchen with Granite Countertops, Custom Backsplash, Solid Wood Dark Cabinets, Breakfast Bar and Sunny Eating area. Master Suite with Large Bedroom Featuring Engineered Hardwood Floors, Slider to the Pool, 2 Closets, and Master Bath with Dual Sinks and Tiled Walk-in Shower. Secondary Bedroom with Plantation Shutters, Walk-in Closet, Designer Carpet and an attached Full Bath. Create your own Custom Space in the Den/Home Office with Engineered Hardwood Floors. Step outside to your own Private Oasis! STUNNING Saltwater Heated Pool with Custom LED Lighting, Sun Shelf, Self Cleaner and Heated Spa. Custom Pavered Pool Deck and Built-In Outdoor Grill Area with Granite Countertops and Seating. ALL Screened in - Relax or Entertain Family and Friends and Enjoy the Florida Lifestyle! All of this in the Popular GATED Resort-Style community of Southshore Falls. State of the art Clubhouse with a Full Fitness Center and Meeting Rooms, 3 Pools, Tennis and Pickleball Courts, Walking Trails, Tons of Events & No Outside Maintenance! Great Apollo Beach Location - close to Shopping, Dining, Entertainment, Beaches, Tampa Cruise Ship Port and More! Pet Restrictions: Please confirm pet restrictions with association.